The lightweight slab technology called Versa-Slab (VS), is an alternative to the conventional poured-in-place reinforced concrete slab (RCC), and / or the precast hollow core plank (HCP). VS is a precast slab technology that requires no decking or support system during forming or curing. It utilizes less cement and reinforcement, and it is about 30% lighter, than either RCC or HCP. It is a lightweight horizontal diaphragm, of the same depth as an RCC or HCP slab, and can be placed manually on floors of one or two story buildings, or with small lifting devices for higher multi-story buildings. The current practice for forming RCC in most countries is putting a deck and a supporting system, more often then not made of wood, and forming, placing and curing concrete over a 21 or a twenty 28 day period. Close to seven 7 days of labor is spent putting up the formwork and removing it. In most developing countries the formwork includes cutting hundreds of trees to support the decking while the RCC is being cured - before it can be used. No work can be done below the slab until the support and decking have been removed, see Figure: 2. The resulting deforestation is an ecological disaster to say the least. 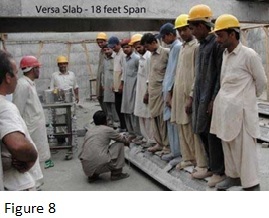 The slab, see Figure: 3, a first generation VS slab was fabricated at site and placed manually (some 2,500 square feet) in less than 5 hours. Rough work for mechanical and plumbing below the slab started the next day. 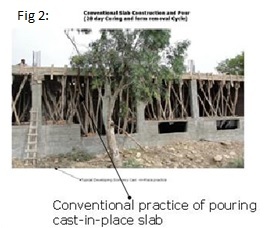 This reduced the floor-to-floor slab construction cycle to approximately 4 days as compared to 21 or 28 days with conventional poured-in-place RCC slab. 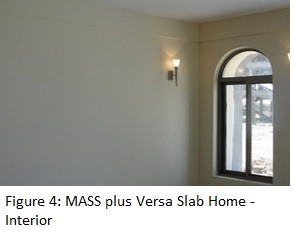 Figure: 4 shows the interior of a "MASS" wall plus VS slab multistory home. The floors have thermal and acoustic insulation, where required. VS on the other hand does not require wood formwork and scaffolding support, and does not require a controlled factory environment for its production. No pre-stressing, post-tensioning, or use of high strength steel, and no million dollar machines for prestressing - as is the case with HCP. Also HCP floors are very bouncy, have tendency to deflect at longer spans and point loads, and prone to accidental failure. A built in camber in HCP often requires additional work to create a finished flat slab. Hundreds of VS slab were built for multiple homes, with slabs lengths ranging from of 6 feet to 18 feet, a customization not possible and practical with HCP. VS has been extensively tested in controlled environment, and has been peer reviewed and validated by US and International structural engineers. VS has established the proof of concept. It has undergone extensive testing in a controlled environment. It shows better seismic failure response under seismic conditions. It exceeds the building code defined safety requirements, including fire separation requirements between floors. The technology finally offers countries that do not have wood, or cannot afford wood, to build affordable structures such as hospitals, schools, and commercial buildings. There is a huge demand for such a technology world over. VS can be designed to take loads several times more than HCP - thereby allowing it to break into the market for buildings that need a high-load floor design in the range of 300 to 400 pound per square feet(sf) such as library, storage spaces, and laboratories. War devastated countries can also use the technology for employment generation and fast reconstruction. Additionally MASS/ VS are extremely robust, allow for required insulation and/or pre-installation of mechanical and electrical (MEP) system components, and can be produced in large scale industrialized / mass production processes, or in small scale production such as a single home. In the latter option it requires very little investment in formwork and mobilization. VS can be installed by also using manual labor, an advantage for countries with high unemployment, for slabs of length of 20 feet or less. For greater lengths some mechanical form of placement is recommended. It will greatly benefit all countries, and especially developing countries, as it will provide employment opportunities in construction as well as in many associated (multiplier) services. In the example of a multistory home, see picture (Figures 1, 3, 4 & 5) several earthquake-resistant homes were built, during the period 2009 through 2011, a few years after a major earthquake devastated the region. 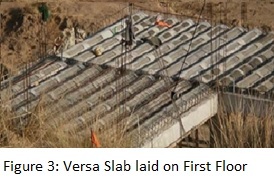 The slab shown on Picture (Fig: 8) are 18 foot clear span self-supporting slab, which were lifted in place by laborers without the assistance of cranes or lifting equipment. This accelerated the construction schedule significantly, resulting in lower construction costs and associated administrative costs. The picture (Figure: 9) shows the façade of a building under construction, with eighteen foot span clear-span VS . The cost at the time of construction was significantly less than comparable homes constructed with masonry (CMU blocks). 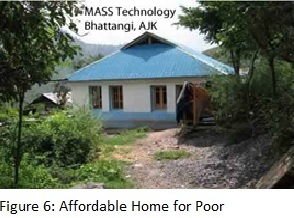 All of the "MASS" built homes, including affordable homes built for the Aga Khan Foundation (AKF) in Neelum valley, AJK, see Figure: 6, have experienced significant tremors and seismic events since their construction and do not exhibit any structural distress (cracks and failures) some 10 years after their construction. 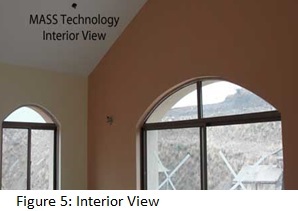 The walls of these homes have an average thermal resistance of R-24 (Resistance to heat flow). Some walls have utilized waste insulation, and have thermal mass so they can leverage solar heating during winter months. The homes require very little cooling in summer. The technology was also used to build net zero homes in Lesotho, Africa in 2015. “MASS” can be utilized to build affordable homes as well as luxury homes and/or commercial buildings. 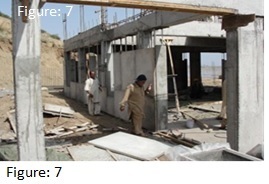 The pictures (Figure: 1, 4, & 5) show luxury homes under construction in Mangla, Pakistan. It uitlized the same MASS technology and the same workers, most of them unskilled, who had built the affordable homes for AKF some years earlier building these luxury homes - thereby getting much needed employment opportunity. These super-insulated homes require far less cooling and heating than conventional masonry homes. They save on spending on fossil fuel and electricity for heating and cooling - which in turn helps reduce global warming and greenhouse gas emissions (GHGe). Hence homes built with MASS are not only cheaper but are also help mitigate climate change (CC). MASS walls are made with precast panels, or poured-in-place concrete reusable forms. When panels are used they are installed quickly as seen in picture (Fig: 7). The picture shows walls being constructed for a multi-story home. The high-strength (using a proprietary process and admixtures) thin panels, approximately 2.5 inches to 2 inches thick, can be fabricated on site using local resources and manual labor, hence providing local employment for both the skilled (masons, carpenters) and unskilled (labor). This in turn stimulates the local economy. Additionally, on-site production of panels minimizes the likelihood of damage if transported. Developing countries usually, especially non-urban areas, do not have the infrastructure, road and transportation systems, or the skilled labor to permit transportation of conventional precast panel wall or floor system. Conventional pre-cast panels are very heavy, require a controlled factory environment for production, and generally require mechanical lifting usually with cranes. HCP and other commercial wall panels are over-designed, adding to their cost, to take care of handling and damage during transportation. They also have to be designed to exact lengths, and cannot be resized at site. On the other hand one type of VS slab can be modified and resized at the site, without compromising its strength or structural properties - a concept unimaginable to engineering science as practiced now. This capibility and flexibilty is in itself a game changer. VS slab have a better deflection charactrestic both over distributed as well as point loads. MASS wall panels and VS floor slabs also allow a greater latitude for errors and omissions (E&O), have built in structural redundancy. The detailing and installation of MASS panels are a lot simpler. There are none of the complicated anchors and embeds typical of conventional precast panel construction. Additionally joints between panels are easily interlocked or sealed, which can be complex and tedious with conventional pre-cast panels. The simple jointing details of MASS makes for a more watertight wall panel system, thus permitting design for flood resistance. MASS wall system was used to build a two story affordable flood resistant home in 2015 in New Orleans, that won the American Concrete Institutes' (Louisiana Chapter) merit award of excellence for low rise building design. In conclusion, VS slab effectively eliminates use of wood from the slab construction process. This reduces deforestation of timber forests. Deforestation is one of the primary contributors to ecological damage to all forms of life. Trees act as heat sink and help in carbon sequestration. They contribute positively to micro-climate modification such as heat absorbtion of Sun's rays, which otherwise would be re-radiated back to the sky and contribute to global warming. Trees also help stabilize hills and mountains, act as a sanctuary for birds and fauna, and fight soil erosion which leads to flooding downstream of hills and mountains, and arsenic poisoning in countries like Bangladesh. Global warming is leading to myriad of ecological disasters. •	MASS and VS are non-combustible and reduce fire hazard. Longevity of the structures is equal to or exceeds that of structures built with masonry, brick, wood, and pre-cast panel system. MASS wall panels have no mortar joints, they are less prone to air and moisture infiltration, and less likely to be damaged by acid rain, salt water and other air-borne pollutants. The non-wood construction is also a plus for many countries. Many Caribbean countries (Haiti, for example), as well as Sub-Saharan African countries, have lost most of their forest and timber reserves and are unable to construct due to lack of an affordable and eco-friendly building material. Especially building the horizotal diaphragm (floors) is a huge challenge. For these countries MASS/VS offers a significant opportunity for affordable construction. The two technology also allow for richer exterior and interior finishes. Application of veneer is very easy without the typical problems of de-lamination inherent with other technologies that use dissimilar materials (such as plaster or brick on a plywood or masonry substrate). 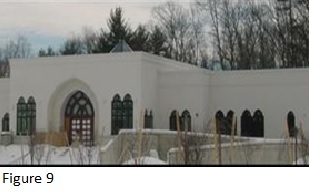 The exterior of MASS buildings can have a plaster/stucco and/or a simulated stone (marble, granite, limestone) or brick, see Figure: 9. Javed Sultan, Architect and Civil Engineer.